Since many of the movies that have been in theaters this year have been less than desirable, I've really had time to catch up on some of the titles that have been nesting in my Netflix queue for months weeks. Over the past few days, especially, I've been watching a lot of stand-up comedy specials--everyone from Richard Pryor to Aziz Ansari. Then I stumbled across Think Like a Man comedian Kevin Hart's specials, I'm a Grown Little Man and Laugh at My Pain. And--you guessed it--they are flippin' hysterical. It's hard for me not to compare every funnyman to the geniuses Richard Pryor and Chris Rock (two of my all-time favorites), but Hart has his own brand of humor that has the raunchiness of those who've come before him and the comedic timing of a guy who, while hilarious, seems to come up with some of his best jokes right on the spot. And, like Pryor, many of his jokes stem from his very troubled upbringing as the son of a drug addict father. Especially in Laugh at My Pain, you see how he turns internal devastation into a punchline. 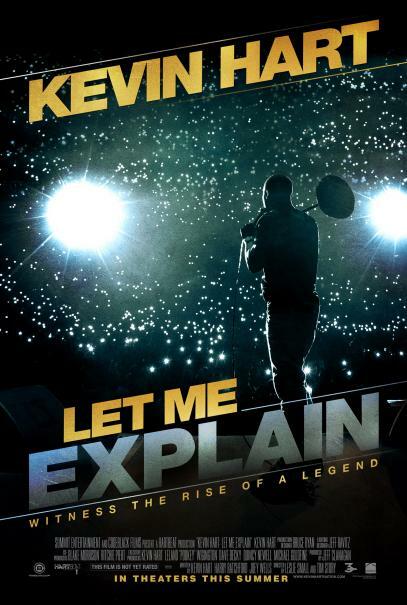 "Kevin Hart: Let Me Explain" captures the laughter, energy and mayhem from Hart's 2012 concert tour, which spanned 10 countries and 80 cities, and generated over $32 million in ticket sales. Hart's "Let Me Explain" tour was one of the most successful comedy tours of all time, with more than 540,000 tickets sold. Both of his shows at New York's Madison Square Garden and his performance at London's O2 Arena sold out, as well as his appearances in Canada, Norway, Sweden, Denmark and Amsterdam. The tour concluded this past New Year's Eve in Los Angeles by selling out the Staples Center and grossing over $1 million in revenue in one night. Only five other comedians – Andrew Dice Clay, Dane Cook, Chris Rock, Russell Peters and Eddie Murphy – have sold out Madison Square Garden where Kevin Hart: Let Me Explain was filmed. I love Kevin Hart, I think he's hysterical. I think it was 'I'm a Grown Little Man' that he brought his young kids out at the end of the show? That was so adorable. yep, that was the one! adorbs!